Club Penguin Cheats by Mimo777 Club Penguin Cheats by Mimo777: New Club Penguin Mountain Expedition Theory! Ok, I have a new theory! Remember when I told you about the secret cave in the Mountain Expedition and the tour says "something" seems live there? 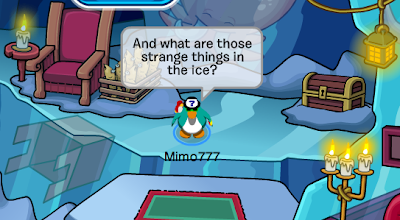 And, what about the strange things in the ice? Would a Yeti freeze odd things in ice? I think NOT! But, couldn't a wizard cast a spell to freeze random things? I think SO! Have you seen the new Series 9 toys? There is a Blizzard Wizard! 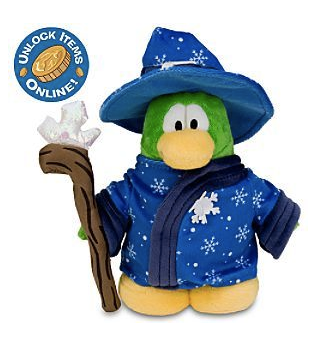 I know there was a wizard costume in the Halloween catalog, but I wonder, why would they make a Blizzard Wizard toy if it didn't exist on Club Penguin? I think, because it DOES! Woot! So, what do you think about my theory? Could a wizard really live in the cave? Will this wizard show up during the Mountain Expedition? I can't wait to hear all your theories! Check out all Club Penguin Toys and Accessories at clubpenguintoys.com. I think Herbert lives there!!!! That's a good theory. But that doesn't explain how the prehistoric sea creatures are still there. I wonder how the person discovered the room and the mountain. I like your theory but those slippers are way to big to be a penguins. Absolutely! I never would have thought the it would be a blizzard wizard. Good Thinking Mimo! Nice idea Seter... allthough, would herbert be wearing slippers? ___________________________________ Lol!I agree with Mimo...I'm sad though!It would be a penguin wizrd and not a wizard like in Harry Potter! Well, I think it’s a pretty good theory. The blizzard wizard fits in nicely, because penguins eat fish and the wizard is a penguin and there was a box of fish in the cave! And, the "out of the ordinary" thing flying through the sky that was mentioned in the Club Penguin Times could have been the wizard flying near the mountain! And those books that are also in the cave could be spell books! Although the yeti is a good theory too, it still doesn’t explain the frozen animals. Also, the yeti doesn’t know how to read, so why would there be books there?? So I’m going with the blizzard wizard theory. Your theory is wrong. The Blizzard wizard is a HALLOWEEN COSTUME not a real person. The person that lived/lives there is a Viking!! Have you noticed the Viking ship for a living room by any chance?!?!?! Or the "random things that were frozen" are FROZEN SABER TOOTHED UNDERWATER SEA CREATURES? and a box... The story is obviously that club penguin was under water in the prehistoric ages, which explains the sabertoothed underwater creatures, and when the ice age came in, they froze in the cave. Millions of years later, club penguin rose from underwater, a Viking found the cave and made it his home by using his ship as a living room but then he left when winter came along because it was getting too cold. the box came from club penguin's more modern years, a penguin tried climbing to the top of the moutain and accedentally left a box in the cave, when winter rolled along, the box was frozen along with everyhing else. Now THAT is what happend, not this "blizzard wizard" theory. I think herbert lives there and the slippers are to keep him warm. in the ds game his hot air ballon goes flying off. so i think it flew up to the top of the mountain and while he was exploring he was resting and he part his arm on the ice and found the room and put his base there. awesome theory Mimo! i got one aswell. when i was there, i saw a shadow! it was gone quick. it was fast. i think the shadow is herbert! Forn2 is right the blizzard wizard costume was sold last Halloween so it can't be that. 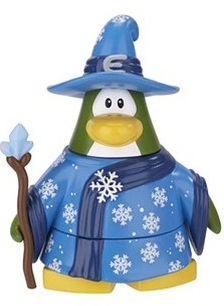 I have thought of wizards in Club Penguin long time ago. I knew that sometime there will be wizards just like ninjas, secret agents and tour guides. I have even sent messages to Club Penguin about it. The Box Dimention has something to do with it. your theory's pretty good but the blizzrd wizard was a costume released. thats a great theory mimo! Hi, emm when I emailed club penguin recently I asked them why we can't meet Sensei live anymore and they said he was busy training ninjas but then they hinted at card jitsu snow or ice.!! Well, lets face the facts. Seen any slippers on the boat? The boat could have been stolen and used as a house. That place couldn't have been sea. Its up in the mountain! I obviously think your theory is incorrect. The Club Penguin Team would probably make a new famous penguin show up (or whatever, maybe not a penguin). Because they're smart enough to know that penguins over the internet would want something amazing to happen, a viking is a statistical impossibility. Yes, it's impossible about the "Blizzard Wizzard" too. I mean, just because there are giant oversized prehistoric creatures frozen in ice doesn't mean its a Blizzard Wizzard. Nobody knows what it is... just keep playing Club Penguin throughout the week and see if anything happens! Nice comments everybody! I don't really agree with anybody.. Lets just see what happens throughout the week! 2) Fish in the corner, Herbert is a vegetarian and he wouldnt eat meat! 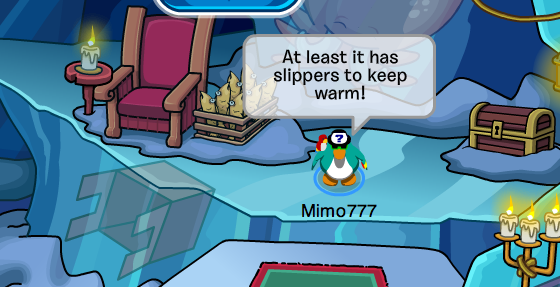 3) The Slippers are to big for penguin flippers! Muttly- yes, herbert whould be wearing slippers. "Now I'm gonna freeze this box, just to proove my awesome powers!" I think herbert is teamed up with the blizzard wizard! There are two chairs in the place and fish and slippers. Herbert is a vegetarian,but the slippers are too big for a penguin! herbert testing to freeze cp? i think this is wrong herbet must live there! he wants to keep warm, its out of sight and the slippers remenber he is cold that must keep him warm a new mission must be coming then. It is colder in the Antarctic (where penguins live) than the Arctic (where polar bears live) so it is technically possible that Herbert would wear slippers to keep warm. But has he ever complained about the cold before? That's what I'm thinking about. I also think that Forn2's theory of the creature being a Viking. So far I think this could either be a Viking, A Wizard or Herbert. These ideas really do fit. But which one is right?! I hope we do find out soon!!!! I'm can't wait to find Herbert/a Wizard/a Viking! The theory almost makes sense. But what about hose big slippers? Besides, the animals are only there from freezing in the ice age (notice the tusks). So it just doesn't fully make sense to have a wizard live there. I still think there is a yeti! Although, I still don't get why the statue is there. The boat is from the viking times but why is there a statue...? Maybe nothing lives there. 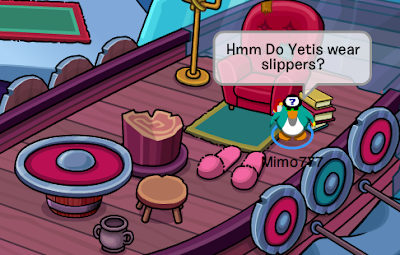 Maybe someone ordered giant slippers from the clothing catalog and tried to get rid of them during the party (by placing them near the chair on the boat. I changed my mind. I no longer believe my earlier theory from 'I put the slippers there'. Think about this. The last mountain that CP explored was the volcano. The Volcano became the Fire Dojo. Maybe this mountain is the Snow Dojo. CP did say that there would be a Dojo for each element. Could the box have something to do with the Box Dimension? Maybe Herbert is going to find some Yeti and unfreeze the animals for some huge evil plot! I have two theories:1.Herbert lives there! 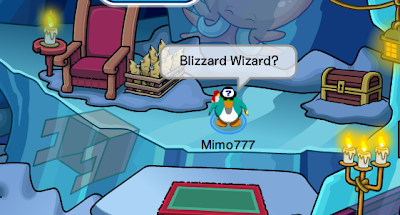 2.Your theory!And it must be a part of card-jitsu,maybe card-jitsu ice?And the blizzard wizard is a kind of sensei! Huh? That has nothing to do with this post. thats just a halloween costume i have the entire outfit! i got it l;ast year at holloween time! it not related to the mountain expedition! VERY CLEVER! Could anyone tell me if it is possible to go into one of the Club Penguin offices?? Nice theory, but I beleive that a viking living there. That would explain the viking ship, and all of the prehistoric club penguin creatures frozen in ice. okay that is not a theory because i have the halloween costume from last year. the halloween costume is the alledged "blizzard wizard" so to those of you who think it was never in the clothing catalog it was. it was in there last year for halloween! The blizzard wizard is a Halloween costume though, I bought it in the October catalog last year. Maybe the waterfall from the dojo leads to the mountain! And a lake used to be in there. So Card Jitsu Water! wow. Ever think of being a story teller? Lets say its defeintly not a penguin!!! Forn...You may be right but so may the others!For all we know we ALL could be wrong!So don't be mean! i think it is not a snow wizard its a wiking penguin see the ship its a viking ship and vikings has a big slippers and the creaturs in the ice cubes likes a viking has thinngs isnt it? I think Herbert landed there when he flew away in the ending of Herbert's Revenge. Notice all of the fire? And warmth stuff? herbert maybe? could still be any of those! Thats a Great theory Mimo! I wonder if the is true and we are going to have a Yeti come to Club Penguin! Try not to use caps try somthing like this. Mimo I dought a wizaed lives there because the frozen stuff has fangs like there from a long time ago. Thats a Great theory Mimo! I think maube we will be seeing a yeti in Club Penguin soon that would be cool! Try saying it like this. Mimo I doubt a wizard lives there. Because the frozen stuff has fangs like there from a long time ago. A lot of people have been saying that Herbert lives there, but there's proof that he doesn't. By the chair above the frozen box there is a case of fish, if you remember from all the PSA missions Herbert is a vegetarian. seter1 said... I think Herbert lives there!!!! 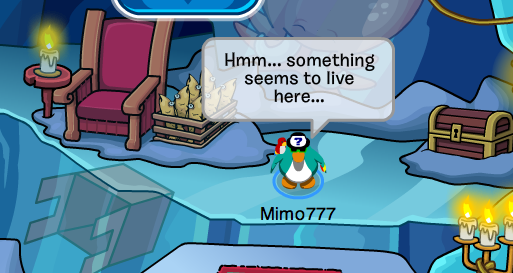 I don't think Herbert lives there cause on PSA missions and on EPF herbert's revenge he says he hates the island and uses his baloon to get off the island.But good Guess! hes come to give us coconut pudding! Okay, I think that probably that animals once lived there and the ice age came and they froze. When the vikings came along they had their ship docked in the water (cuz there must've been an ocean) in the cold arctic. They were too cold to survive. Then slowly over time the entrance had froze. But thats not it, yet. There is a frozen box and a penguin play award. Maybe a it was once a famous penguin that has been hated and he ran to the cave and threw his box of stuff and penguin play award in there, and he just made a living. And he has those frozen memories to keep alive. Some of that could be true, but how does that explain the "out of the ordinary" thing that was seen flying through the sky by the mountain peak? I think the evidence better supports the wizard than the Viking. Maybe a Viking used to live there, but Vikings lived hundreds of years ago! It dosen't make any sense Forn2 said that obviously cp was underwater in prehistoric times. I mean you can’t say OBVIOUSLY! That is a good theory though, but just because there are prehistoric animals in the ice, doesn’t necessarily mean a Viking lives there! The Viking ship was probably just got frozen there in Viking times(that makes a lot more sense)! And if the blizzard wizard is just a Halloween costume, then why does the wizard randomly have snowflakes on his robes? Coincidence? I THINK NOT! It's a blizzard wizard that lives in that cave!! So yea viking, yeti, blizzard wizard, or herbert! It's totally brett farve! He's a viking! And its a viking ship! Brett Farve is in that cave because he's retired(which explains the slippers and books)! And the object that was seen "flying" near the mountaintop was a football! It all makes sense!Brett Farve isn't there right now because he heard penguins were coming and hid, because he didn't want anyone to know that he was retiring yet!It is DEFINITELY Brett Farve! All of you are wrong! I live there! Now get out of my home!!! It took me FOREVER to find a hot-air balloon the get up there! I've been reading through all the comments and im laughing on the inside at how many theories there are. Everybody thinks they're right, but i guess we will find out in the end. Best theory i've heard yet. great theory! It is DEFINITLEY not herebert because there is fish there that are in a box that are for dinner (thats what it looks like) and Herbert is vegetarian! Oh its definitely the next ninja game! Vikings once docked in the water and never got back to their ship. Then Herbert comes later and he probably had the box and stole the penguin play award and stuff, and it froze over time. The slippers are just a distraction. Sorry, I have MANY theroies. Everybody keeps talking about this flying object at the mountain? What are they talking about? The blizzard wizard hat and robes, are real items on CP. I have them! You could get all of them in 09. You guys are wrong its not Herbert's Hideout. Herbert is a Vegetarian so why is there a box of fish next to the chair if Herbert doesn't like fish? Plus he doesn't like cold so there would be more fire. But.. the creatures are prehestoric, and they have been there for a long time. (DUH!) Rumours say that Sensei has been spotted many times before he revealed himself. Also, there is a pathway leading somewhere, but you can't walk through it. Thats wat I was Just thinking you stole my idea. lol. But yes I TOTALLY agree with you! But if you read what herbert says about his escape FROM the cold in the missions. I don't think he would live in a ice cave. I think it might be to do with snow ninjas too. or Herbert has tricked the wizard? i think herbert made the cave in the mountain i don't know how or why but perhaps there will be a new mission about it??? mayb its the box one of those boxes that you can go inside or the time machine box from the dinsaur play !!! i bet its santa claus lol only joking its probibly herbert because big slippers for warmth and the strange thing in the sky is his hot air ballon! The blizzard wizzard outfit is in the treasure book Mimo. Herbert is planning to freez us to stop us,then he gathers wood to make the fire he wanted the first time we saw him! Mimo, it's just a penguin Halloween costume. Great theory though. I guess we will have to wait. For some reason, whenever I post something, it says its posted, but never comes up. Oh well. Here's my theory again. I think that since club penguin is an iceberg, it floats around the world. Eventually it floated to where Vikings lived, and they sent of an expedition to see if they could live on the island. They named it Greenland, because everyone knows that vikings are colorblind. What we are discovering now is the remains of their freezer. Used to store Saber-tooth animal popsicles, many vikings were not smart enough to realize that slippers and boats don't melt. One day, their colorblindness went away, and they left the island fearing that they would get teased by the other barbaric tribes. As the location is very sturdy, the warranty of the freezer expired last week, thereby unlocking this prime spot of real estate. Real estate penguins then used this opportunity to hand out pamphlets in order to annoy the general public and sell this good spot. Needing a frozen home similar to the North Pole, Herbert took a look around the place. He liked it. Whenever he tried to eat the saber-tooth popsicles, he always got too cold to get to the yummy fishy centre. Currently he is off trying to create an over-complicated plan to heat up the island just to thaw out his popsicles. What do you think? Sorry bout my last post, didn't mean to put cpg mod at the end. Awesome idea!! But I think it could have something to do with snow ninjas. Also the slippers look WAY too big for a wizard, unless it's some kind of mutant-penguin-wizard-thingy!! Oh no that could be it!! One problem, Herbert is a vegetarian. I believe it's a Yeti who is going to attack Club Penguin and eat us all. I emailed the club penguin fan mail, and they are keeping it a secret. They are giving no hints at all. I tried. Ok, my theory is!... mimo's theory could be correct and I also saw a penguin wearing a blizzard wizard outfit. But the blizzard wizard seems like a normal sized penguin so I wonder what would two LARGE slippers be doing there? and doesn't Herbert like the warm?!! And another thing maybe we might need to check the cave occasionally fo things that might come up. Lol I do very long theories. I still think it is a Yeti's home. Those extinct creatures were just frozen in the CP Ice Age. And the Viking ship was frozen, then thawed, and now the/a Yeti lives there. But, there is a 50/50 chance it is a Yeti or Blizzard Wizard. Can we not do all caps? Thanks. He did say he didn't like the cold. I don't think anyones said it yet but MAYBE just MAYBE CP decided to throw that in there just to get us thinking. Wait...I've been thinking. All you people who think Herbert lives there. This is a VERY puzzling mystery BUT there is fish in a box beside a chair. Now, Herbert is a vegetarian! And vegetarians don't eat meat. And fish is meat! So what would a tub of fish be doing in a suspected Herbert's cave?? I respectfully disagree with your theory. I believe it is Herbert. Unless most penguins on clubpenguin are wierd, overgrown angel penguins and the wizard is a emperor penguin, it's impossible, because those slippers are too big for the penguins. did club penguin update you when the monster in the cave will be shown? Great Theory! I was thinking that too. At first I admit I DID think that Herbert was it. But a Blizzard Wizzard makes more sense. Still think its Herbert mimo, but nice idea! Remember the Adventure Party not so long ago ? The boat is from that party ! The members only room where it was two boats, a red and a blue i think, and they had to battle it out. I hope it helps with your theory ! I think a penguin is up there. first of all herbert couldn't have gotten slippers he doesn't have a sewing kit and certainly cannot get the slippers himself. Plus if there was a yeti, well the ship is ancient. If a yeti came from that ship the yeti would be XP by now. there are lit candles so how does someone get the tools? by buying them. and the only people who can do that are penguins. That is my theory. What room is that in? Can't be Herbert! Herbert's a vegetarian (only eats veggies). He would not have a case of frozen fish!